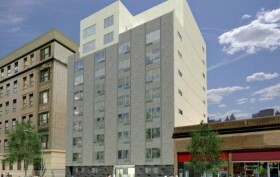 In April 2015, developer Sutton Management applied to utilize the city’s 421-a program for a new project at 607 West 161st Street in Washington Heights, just off the New York Presbyterian campus. They received approvals that 13 of the Jeffrey Cole Architects-designed building’s 62 units would be reserved for those earning 60 percent or less than the area median income, and today these units have come online through the city’s affordable housing lottery. They range from $868/month studios to $1,085 two-bedrooms, and for an additional fee, lottery residents will have access to a fitness center and bicycle room.